How to listen to audiobooks on Apple Watch without iPhone? What’s the best device for listening to music and audiobooks while running or sports? The obvious answer to this would be the Apple Watch. It is small, not awkward as iPhone and iPad, and it is designed specifically for workouts. However, Audible still hasn’t released an app for Apple Watch. Audible has been fantastic in its support for iOS devices, so why not the Apple Watch? This doesn’t make any sense. If you like listening to Audible audiobooks while you work out, you may be disappointed to learn that there isn’t an official way to play Audible audiobooks on your Apple Watch. But don’t despair. If you have DRM-free Audible audiobooks in MP3 format, you can still get your Audible audiobooks delivered straight to your ears from your Apple Watch. This article will show you how to play Audible audiobooks on your Apple Watch. Scroll down to Available Apps. Tap the Install button next to the Audible app. Download your audiobooks to the Audible app. Go to the Library tab in the Audible app on your iOS device (iPhone or iPod Touch). Tap the menu button (3 dots) next to the audiobook you want to add to the Apple Watch. Tap Sync to Apple Watch. Make sure the Apple Watch is on its charger or that the Audible app on the Apple Watch is open during the entire syncing process. The audiobook will be added to your Apple Watch. In the Audible app on your iOS device, a watch icon will show next to the menu button (3 dots). This indicates which audiobooks have been added to the Apple Watch. Open the Audible app on the Apple Watch by either saying 'Siri, open the Audible app' or by pressing the knob on the watch and tapping on the Audible app. Tap the Play button to start listening. The most recent listened to audiobook will be displayed. iTunes Store is also a good place to purchase audiobooks. You can enjoy the iTunes audiobooks on your iPhone, iPad, iPod Touch through Books app or on Mac/Windows through iTunes. However, there is no such an app for Apple Watch. 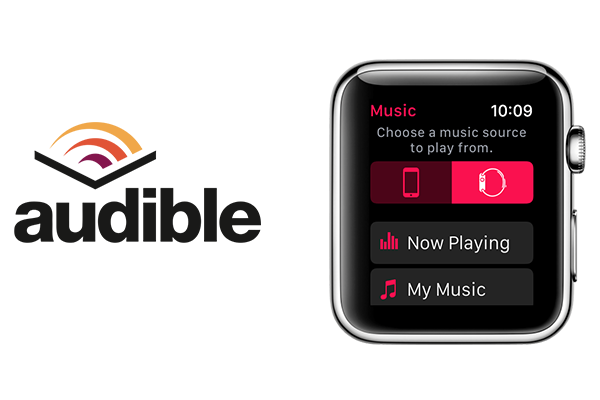 You canadd specific albums, playlists, and podcasts to your Apple Watch by syncing them. After you sync, you can play the music on your Apple Watch without your iPhone, but you still can't add audiobooks to your watch. The only way to listen to iTunes audiobooks is to convert the iTunes audiobooks to mp3 files and then sync them to Apple Watch like other songs. iTunes audiobooks are formatted in DRM-protected M4B and M4P format. To convert them to mp3, you will need professional iTunes audiobook converter - Ondesoft Audiobook Converter. First download it on your Mac or Windows. 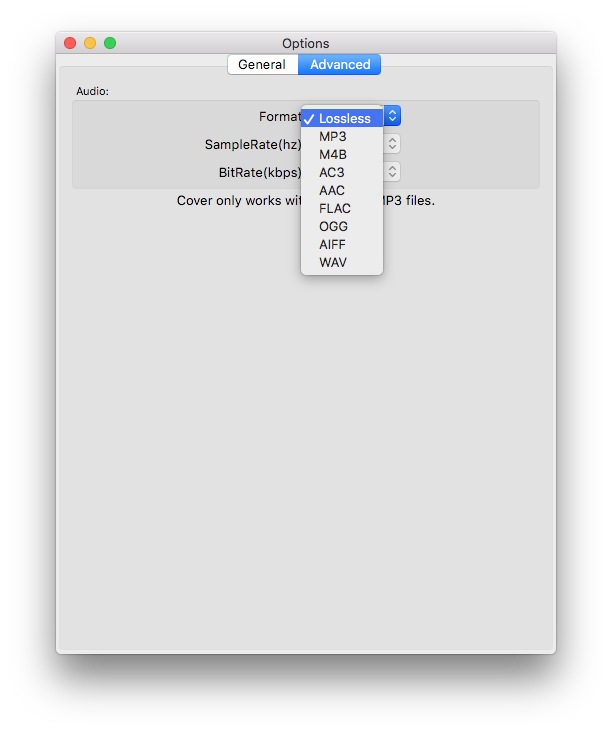 After installation, run Ondesoft Audiobook Converter, then iTunes will be launched automatically. All audiobooks in your iTunes audiobooks library are shown on the right side of the main interface. Select audiobooks that you want to convert by clicking the checkbox in front of each audiobook. You can select multiple audiobooks at once. 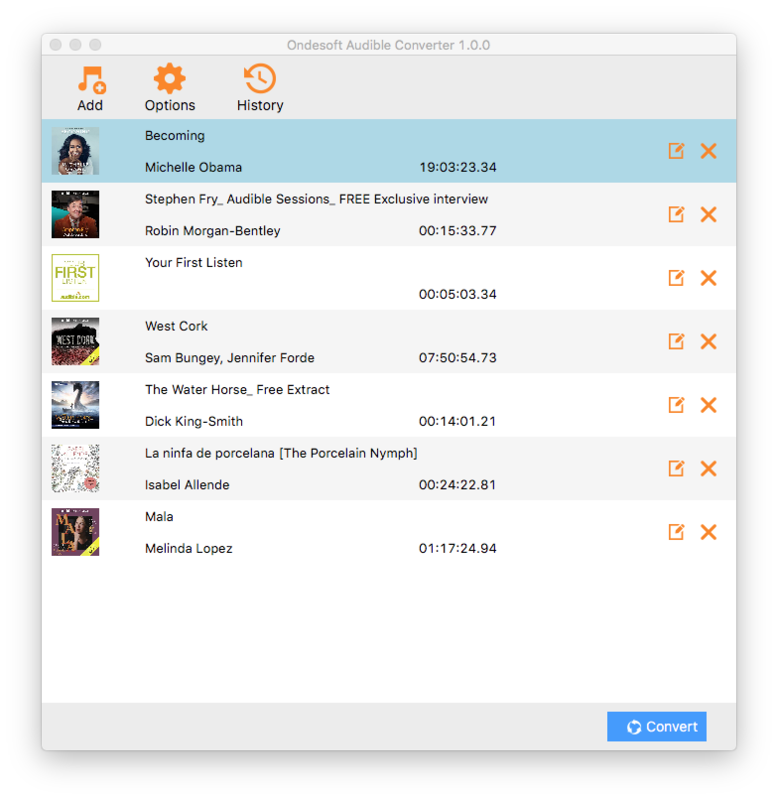 After choosing audiobooks, you can change the output format, name, folder and other information at the bottom of the interface. Click the Options button, you can also customize Codec, Bitrate, SampleRate and Channels as you like. What’s more, you can change the conversion speed, select automatically start conversion when you press “Convert” button or set a custom format for output filename. If you select to save metadata and chapters, then the audiobook will be fully tagged and divided at the chapter points. Notice: Here under the “General” tab, there are several options you can choose: set the conversion speed, automatically start conversion when you press “Convert” button, uncheck all completed files after conversion, or set a custom format for output filename, save metadata and chapters. Then the audiobook will be fully tagged and divided at the chapter points. Click the Convert button at the top of the main interface to start converting audiobooks to MP3. 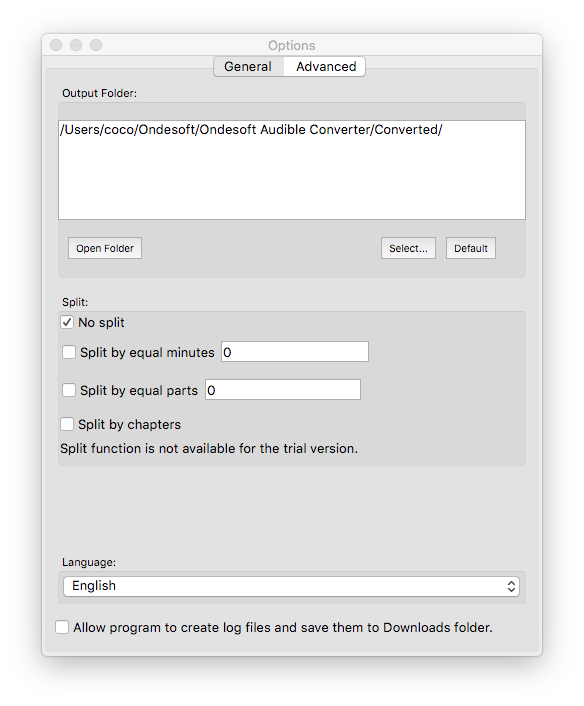 After the conversion, you will find all converted audiobooks on the output folder. Step 1. Launch iTunes on Mac or PC and click the Music tab. Then create a new playlist called "Audiobooks" or anything you like. Step 2. Load the converted iTunes audiobook files into the newly created playlist. Step 3. Sync the new "Audiobooks" playlist with your iPhone via iCloud or a USB cable. Step 4. Open the Apple Watch app on your iPhone > Music > Synced Music, and select your "Audiobooks" playlist (it should say "Sync Pending"). Step 5. Attach your Apple Watch to its charger with your iPhone within bluetooth range. And then wait it to sync. Step 6. Once the audiobooks are synced to your Apple Watch, you can play the iTunes audiobooks via Apple Watch freely without a nearby iPhone. Notice: Free trial version users can only convert each audiobook for 3 minutes. However, you can break the limitation by purchasing a full version. How to play audiobooks on Android devices? How to play audible audiobooks on mp3 players? How to listen to audible audiobooks on iPod?